A double decker bus tour provides panoramic views of San Jose’s most important landmarks and neighborhoods, accompanied by live guided commentary that brings the sights to life. This 5-hour tour also includes two short walking segments for a closer look at San Jose’s highlights. Meet your guide at your hotel prior to your selected pickup time. 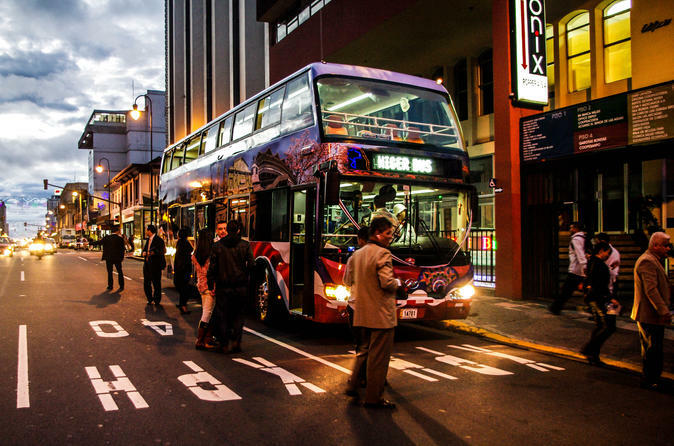 Get on-board Costa Rica’s first European-style double decker bus and begin your 5-hour tour of San Jose, the capital city of Costa Rica. Learn about San Jose through live commentary from your guide as you drive through the city’s neighborhoods and past its major landmarks. Seats on the upper deck of the bus provide panoramic views, while seats inside the bus feature wide viewing windows and street-level sights. Break up the drive with two walking tours that allow for a closer look at some of San Jose’s most important sites, including the National Stadium, Central Market, and Braulio Carrillo City Park. This tour also includes a welcome cocktail and marimba folk music performance on the bus. Tour upgrades available for those wishing to eat a traditional Costa Rican lunch or dinner onboard the bus, as there is no free time built into itinerary for meals on your own.